Angel Armor offers custom-cut ballistic panels for the most popular patrol cars on the market today. Those ballistic panels slide into the car’s door, where they fit securely and offer officers with outstanding NIJ Level IIIA ballistic protection. Imagine the expanded opportunities having Angel Armor ballistic door panels could provide patrol officers responding to an armed robbery, an armed disturbance, conducting high risk car stops, or even during the awful event of an ambush. One of the most important training lessons officers learn about police cars is that they are not “cover”, or a barrier that will protect an officer from bullets. Even handgun bullets will penetrate doors and fenders. The only potential protection comes from staying behind the engine block. That is not always possible or practical, leaving the patrol car as almost more hindrance than benefit. Bringing the Bear Cat on every high risk call is unrealistic. Throwing spare body armor over the door of the patrol car will not be secure, does not provide adequate coverage, and realistically is not available. Most departments do not have spare body armor to place in every patrol car. Even if they did, it would be old panels that are no longer reliable due to age, improper size, and wear. The Angel Armor Ballistic Door Panels are the right tool for solving this long-standing problem. By adding tailor made ballistic panels to the most popular patrol vehicles on the market today, officers are provided the added protection they need while remaining at the relative safety of their patrol car. With Angel Armor “up-armored” patrol vehicles, officers can perform some of the most dangerous job requirements in a much safer work environment. With Angel Armor in your patrol cars, the patrol officers have as close as it gets to a mobile ballistic barrier. The standard cost of an Angel Armor Ballistic Door Panel is $1350, with special pricing for dealers and department orders. Consider the amount of protection being offered by the door panel. NIJ Level IIIA armor is some of the strongest ballistic protection available, capable of stopping the powerful .44 magnum round, and the super hot 124-grain 9mm traveling at 1400 ft/sec. The panels are custom made to fit the doors to provide maximum protection. In comparison, an officer’s personal body armor from a quality manufacturer is going to cost $600-$1000. When evaluated from all angels, the price of Angel Armor Ballistic Door Panels is very reasonable. Using proprietary technology, Angel Armor’s Ballistic Door Panels are cost-effective, lightweight and surpass stringent environmental testing. They provide law enforcement with maximum safety and peace of mind, exceeding NIJ IIIA standards for multi-round protection as well as special protection against rounds such as the .45 ACP Speer Gold Dot Hollow Point and 9 mm Luger Federal LE Tactical Hydra-Shok. Installed inside the door within minutes, Angel Armor’s Ballistic Door Panels protect while adding less than 10 pounds to the vehicle door. Angel Armor Ballistic Door Panels (Level IIIA) are the industry leader in revolutionary protection. With a lightweight, weatherproof and patented design, these ballistic door panels for Ford vehicles install in just 5 – 15 minutes. Surpassing NIJ 0108.01 standards, this is protection you can stand behind. Special Dealer and Department pricing. Ford Taurus (2010 & Newer Models). Cadillac Escalade (2015 & Newer Models). Dodge Charger Pursuit (2011 & Newer Models). If you somehow use a patrol vehicle not listed, Angel Armor expresses their desire to expand their offerings, and you can contact the company for the potential to have your agency’s vehicle outfitted with ballistic door panels. The Angel Armor Ballistic Door Panels have just recently received the highly respected National Tactical Officers Association (NTOA) Member Tested and Recommended status. The evaluation program provides 2-4 select NTOA members across the country with the product to be tested, and scored in 13 possible categories on a scale of zero to five. Angel Armor has achieved the coveted NTOA Member Tested and Approved status with a score of 4.88 out of 5.0 (Photo by Angel Armor). In order to receive the coveted “Members Tested and Approved” label, a product must receive a minimum 3.0 score. 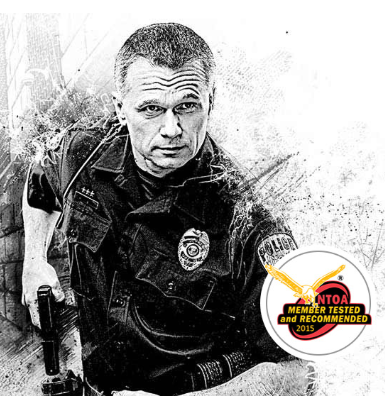 The Ballistic Door Panels from Angel Armor have been recommended by the members of the National Tactical Officers Association, and received an outstanding 4.88 out of a perfect 5.0 score. One Law Enforcement Product Reviewer awarded the Ballistic Door Panels a score of 5.0 in all 13 categories, totaling a perfect score. 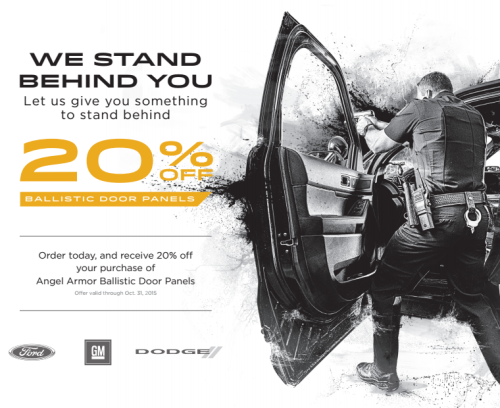 Angel Armor Ballistic Door Panels give Law Enforcement the advantage to protect and respond. The thin and lightweight design installs with unprecedented ease, and is the fastest in the industry. EDITOR’S DECLARATION: Angel Armor has invited the BlueSheepDog crew to attend the Media Day at the Range during SHOT Show. We are very grateful for Angel Armor’s invitation. BlueSheepDog has not received any financial compensation from Angel Armor to publish this article. Angel Armor is now offering 20% off to support law enforcement in these times where so many officers are coming under such intense and ruthless attacks.